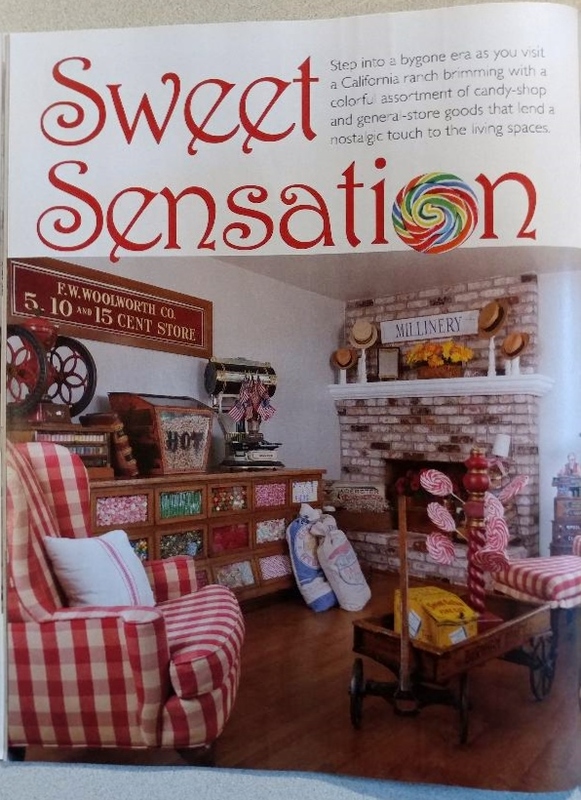 I'm pretty excited for a friend who has a home featured in the new issue of Country Sampler Home Tours 2019! But I'm also excited for me, because Vintage Gal Antiques is mentioned, too!! 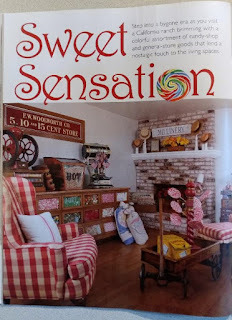 The article is called Sweet Sensation and Karlee's home is full of all the wonderful country store antiques that I love! 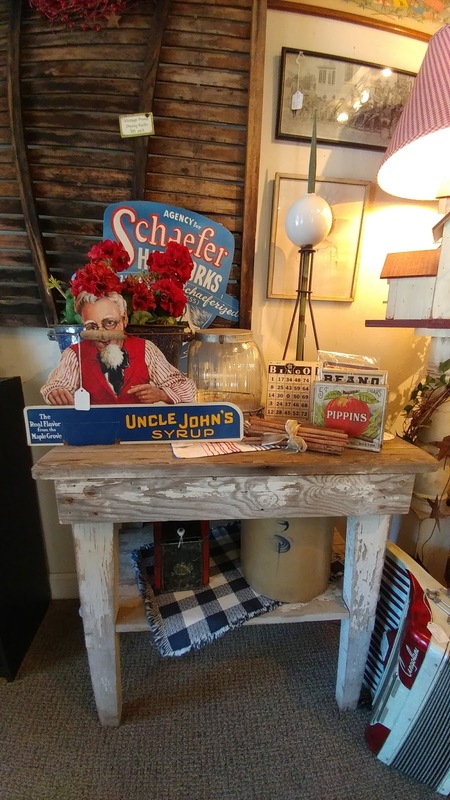 An awesome antique country store bean counter, fantastic store bins and tins, a beautiful oak hoosier; everywhere you look there are some amazing pieces! Karlee purchased some bathroom collectibles and quirky quack medicines from me and they are displayed in one of the photos. 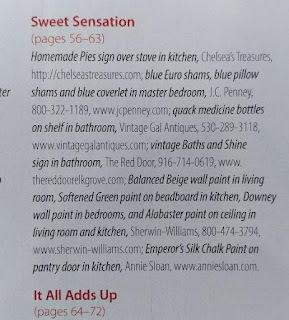 Vintage Gal Antiques is mentioned in the Resource Guide and I'm thrilled to be included! Thank you Karlee! Vintage Gal Antiques will be selling here! It's one of my favorite shows - come and check it out! Cheerful China ~ Spring Is Almost Here! Blue Ridge China was manufactured by Southern Potteries Inc. from the 1930’s until 1957. Well known for their underglaze decoration and colorful patterns, Blue Ridge pieces have been popular as dishware for cottagey and country décor. The underglaze technique made the decorations more durable and even though basic patterns were used, no pieces are exactly alike due to all being hand-painted. Hundreds of patterns were made and, for the most part, painters freehanded the details. These differences made each piece an original work of art and truly distinctive. By the time World War II broke out, Southern Potteries was one of the largest producers of china in the United States. Its workforce was completely unionized and almost half of the employees were painters. Starting wages for painters was 13 ½ cents an hour during 1941! Although Southern Potteries employees over 1,000 workers and a leading producer of china, the company was unable to overcome the onset of plastic dinnerware introduced during the 1950’s. By the end of 1956, Southern Potteries was down to approximately 600 employees; many of them only worked part-time. In January, 1957, the board of directors voted to close the doors and did so without resorting to bankruptcy, providing stockholders with a final dividend. 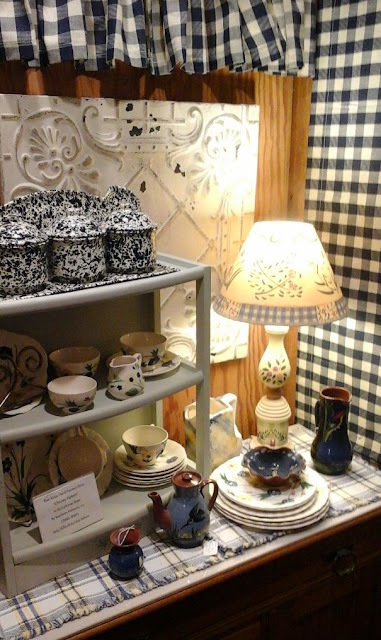 Over the years, Vintage Gal Antiques has carried several patterns of Blue Ridge China. Currently, I have several pieces of the Chicory Pattern in the fluted, colonial shape, including a sugar and creamer set. This pattern, primarily in yellow and blue colors, is one of the more difficult patterns to find. I’ve displayed it with some Torquay glazed earthenware that is also very collectible. I love the rich cobalt blues alongside the happy colors of the Blue Ridge China. Also featured is a large vintage ceiling tile and a new blue spatterware porcelain enameled cannister set. All Blue Ridge China pieces available separately or as a set. Please email for price list for all items. 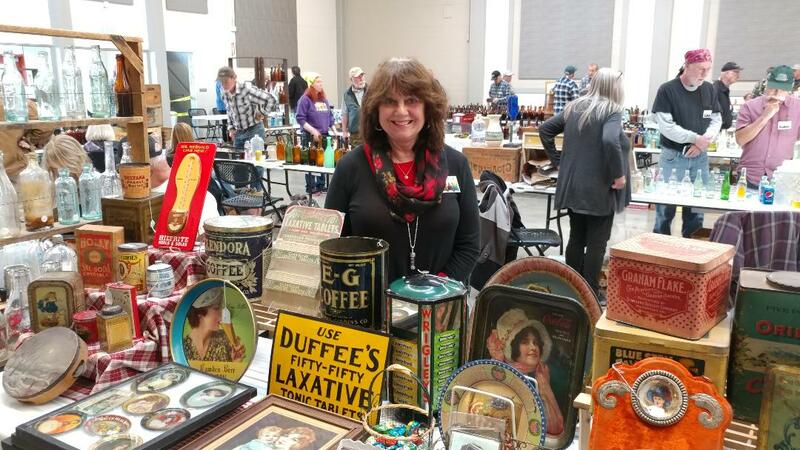 Rick and I enjoyed selling at the most recent antiques/bottle show in Roseville in early December . 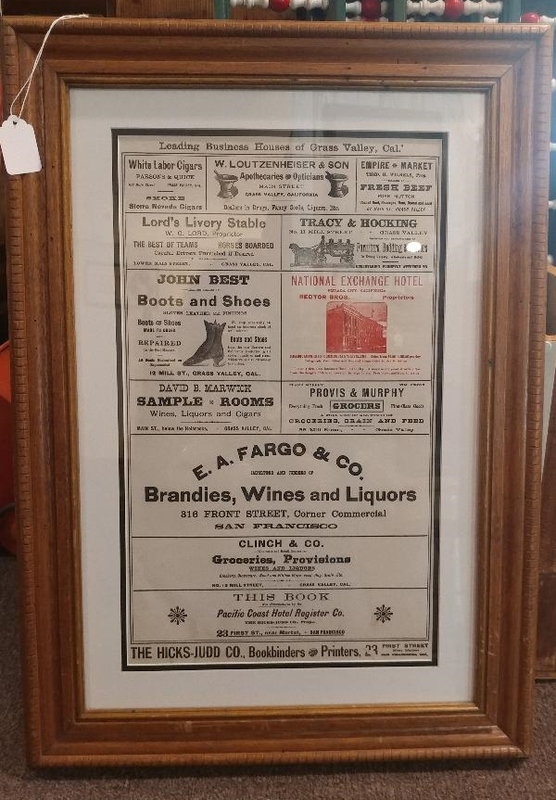 "Best of the West" always lives up to its name and has a wonderful variety of antique bottles, country store items and advertising. 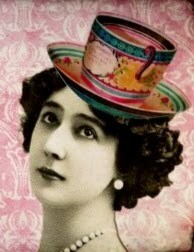 I sold mostly advertising tins and trays. The show was a one-day show this year, and it was constantly busy, so not a lot of time to wander around and see what else was there! It was a successful show for everyone! The next show, actually, the first show of 2019, is in Anderson, CA on Saturday, January 26 at the Shasta Fairgrounds. Hard to believe some of these shows have been continuously produced for so many years-this one is in it's 43rd year! We'll be there so if you're in Anderson, stop by! You just never know what you might find at these shows! and will re-open in April, 2019. I'll be selling at shows until then! Christmas I created another fun way to wear several at once! I found a plain gold-tone link chain and attached several Christmas trees on it to make a statement necklace! Voila! 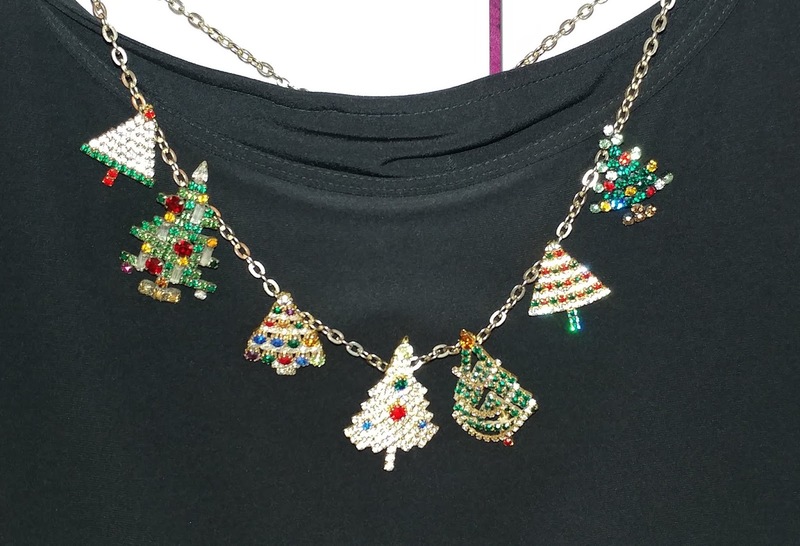 Getting into the holiday spirit with plenty of sparkle! 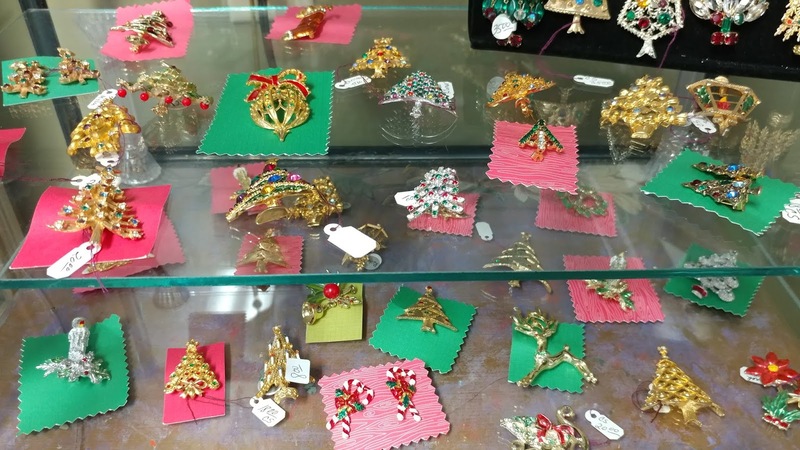 Vintage Gal Antiques has a great selection of vintage Christmas tree brooches, earrings and other Christmas ornament jewelry for sale. Come and check it out! Vintage Gal Antiques is more than just another stuffy antique store! 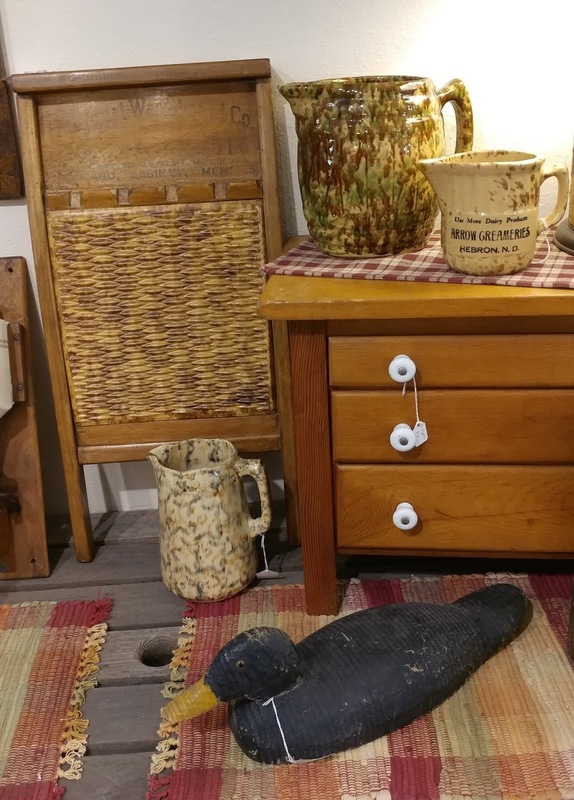 You will find an eclectic blend of old and new items. 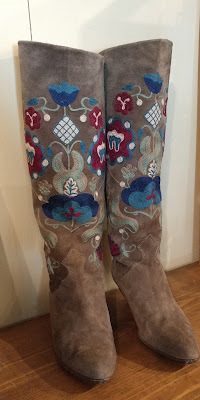 Whether it be primitive, country or blingy, when I'm out and about, shopping for resale, I try to find items that are a little quirky or unusual. Some popular new items are my "sweet and sassy" gift tags and note cards which are all my own original designs. 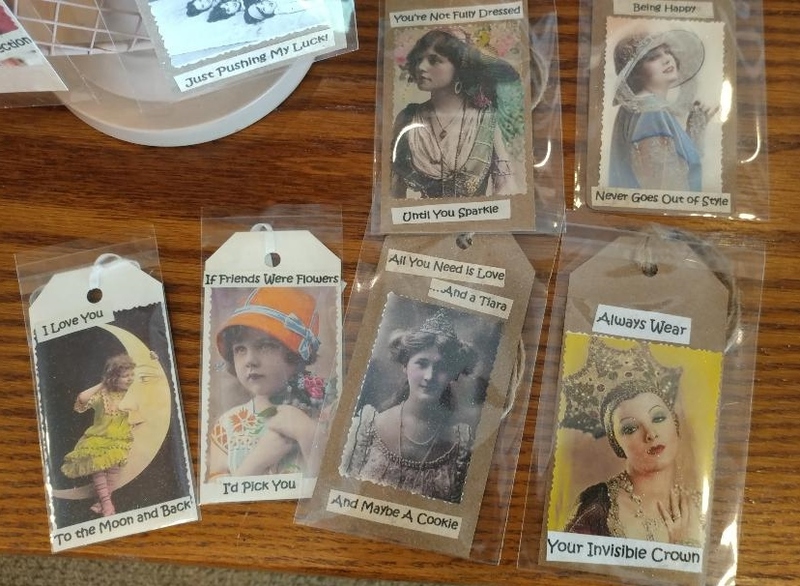 Each gift tag or card is protected in a clear sleeve and priced from $1.50 to $3.50 each. The gift tags are a fun way to add sass to a gift or tie to a bottle of wine to make it special! 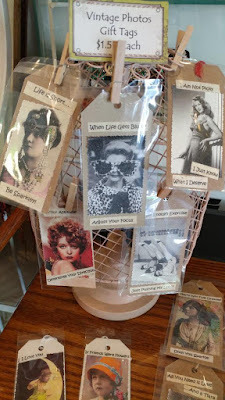 Vintage and retro photos with cute sayings, like: "All You Need is Love...and a Tiara, And Maybe A Cookie". Or maybe "Whoever Said Less is More, Obviously Wasn't a Wine Drinker! Witty sayings for many different occasions! The note cards available are generally local scenes and historic photos related to Gold Rush days. One of my favorites is a family photo of Rick's grandfather. I believe it was taken at an early Pan Pacific California Expo in San Francisco. It's just a great old photo! So if you need a last minute card or gift tag, come and check out the great selection. And browse the rest of the store...you never know what you might find! Hoping everyone has a wonderful July 4th! 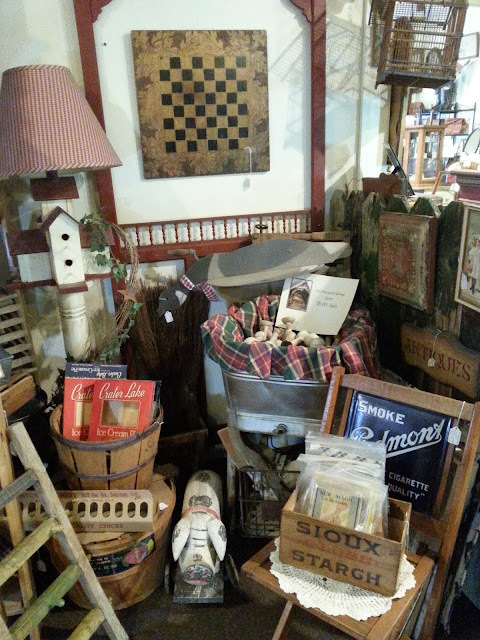 Vintage Gal Antiques will be open everyday at 10:00 am, July 1 through July 8, during the holiday. Downieville's parade is ALWAYS on July 4th, no matter what day of the week it is. The holiday festivities, including the bbq and street dance will be Saturday, July 7. Enjoy! Excuse Me, Do You Have a Match? 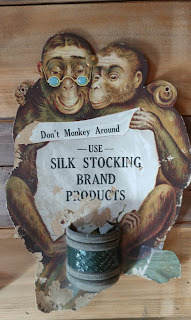 Several years ago, I purchased a large collection of antique advertising. 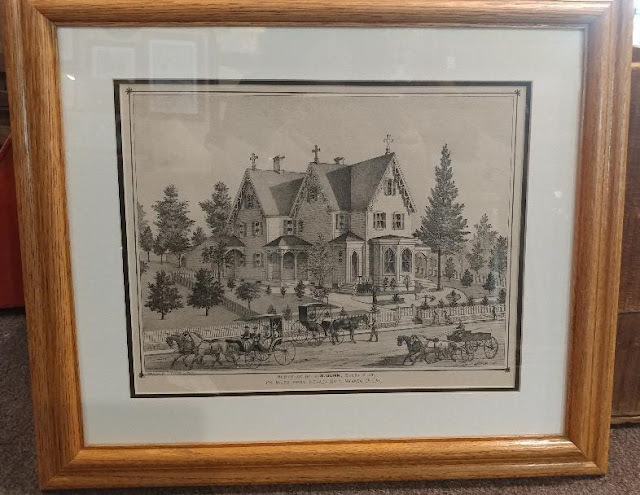 I was excited; this collection was owned by a long time savvy antique collector, who had collected for many years and who had a good eye for what would become valuable in the years to come. We shared the love for similar antiques. 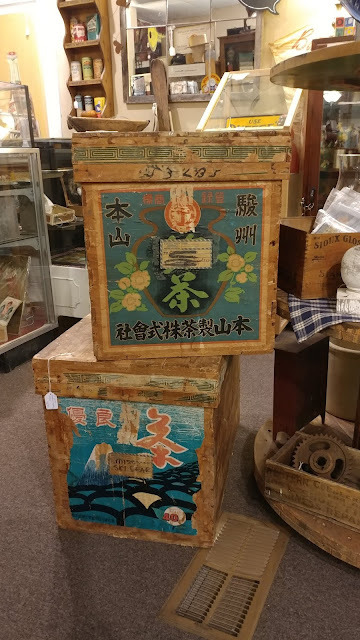 I absolutely love anything and everything “country store”, and this collection included many store tin containers, porcelain and tin advertising signs, advertising calendars and other “go-withs”. instant collection! Probably the most unusual one is the cardboard paper match holder with the monkeys advertising silk stocking brand products. I’ve never run across another one like this. 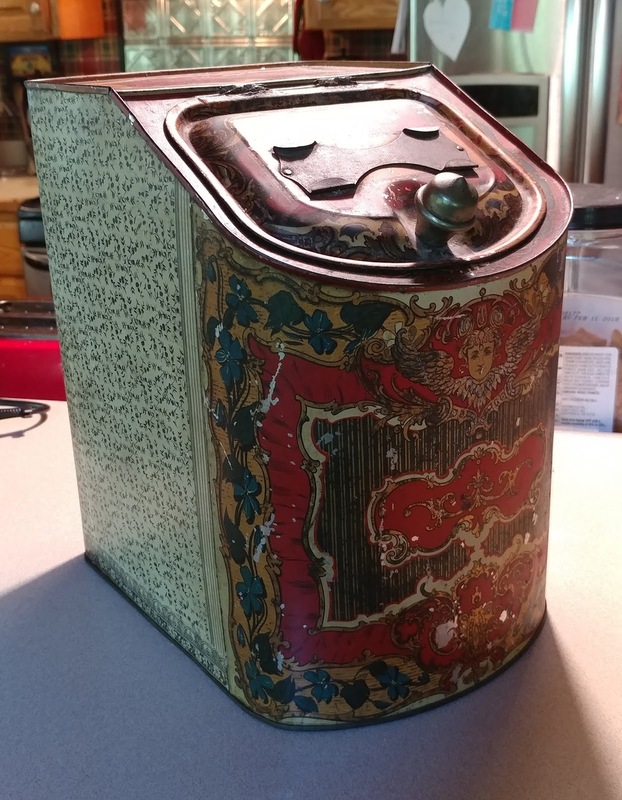 Match safes were popular from 1870 until the 1930’s when matchbooks and cigarette lighters replaced the need for most match holders. At home, match holders were used mainly for lighting a stove. 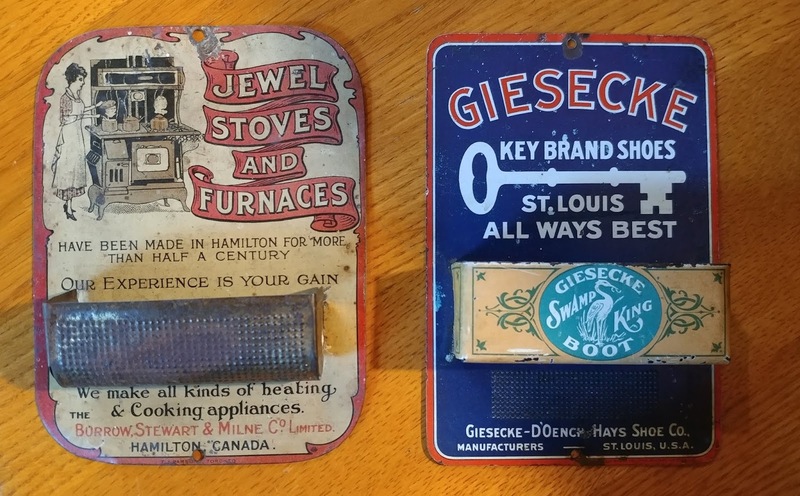 Stove manufacturers often advertised their products on cast iron match holders which could be mounted to the kitchen wall to keep matches handy. 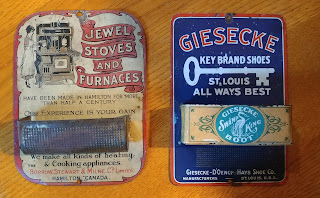 Other wall mounted match holders were made of tin and featured lithographed advertising for various products. So now I have this great collection and it was a challenge to decide how to display it! I didn’t want a lot of nail holes in the wall, so I purchased pallet looking hanging boards at Ben Franklin (or Michaels Craft store) and grouped the match holders on the pallet, which I hung on the wall. As I accumulate more match holders, I can hang more pallets. I’m still on the look out to add to my collection. After all, it’s the thrill of the hunt! Well, my landlords have the building for sale that I've been in for 13 years. I know it was a hard decision for them, but they have circumstances that are priority right now. The Downieville real estate market is currently very popular and I'm a little nervous about my future. 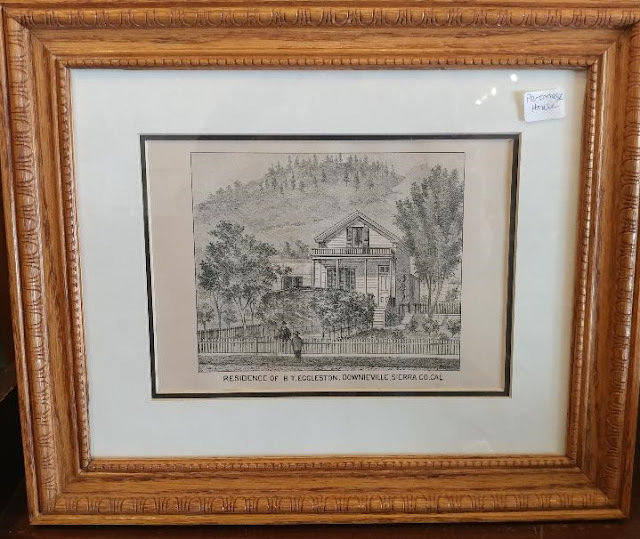 Welcome to Vintage Gal Antiques! So I thought I'd take advantage of the photos of my shop on the real estate site. 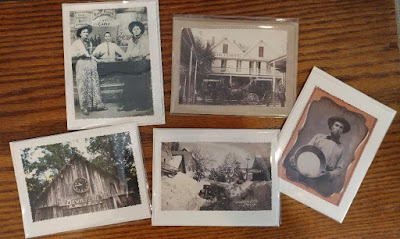 If you've never been to Vintage Gal, these professional photos might help you make my shop a destination in Downieville. 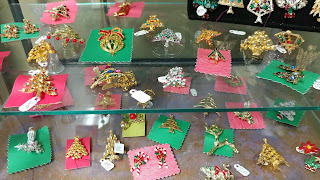 The photographer didn't take photos of my Bling Room or the Western Room, but, if you're a jewelry lover or western boot collector, Vintage Gal is your place to find a fabulous selection! I'm hoping to be here for a few more years, but we'll see how things play out! Vintage Gal Antiques is open Thursday-Sunday 10am - 4pm. Starting July 4- I'll be adding Wednesday - Sunday. If you'd like an appointment, please give me a call! Hope to see you soon! The Nevada City Elks Lodge Antique Show-End of the Day! 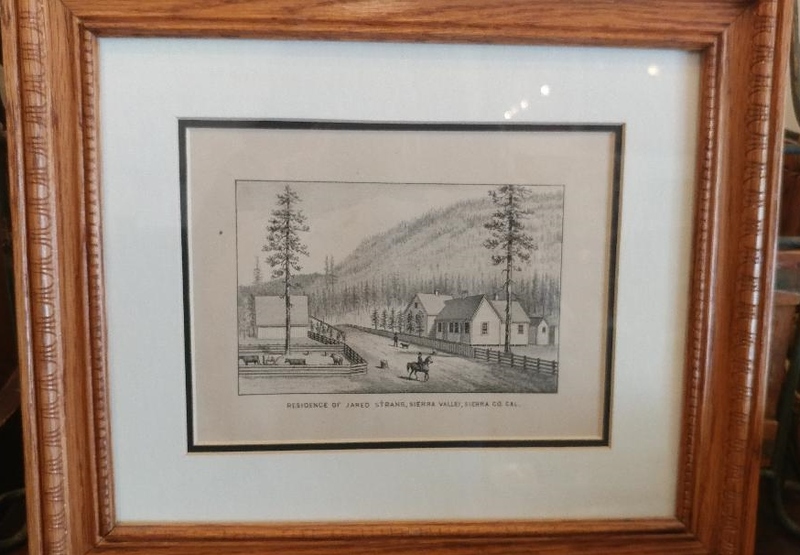 Just got home from a long day selling at the Nevada City Elks Lodge Mining & Antique Show. I was up at 4:30 this morning so I could get my 2 ½ cups of coffee in before getting the day started. The show started at 7am in the parking lot for all the mining and rusty stuff and the indoor antique show started at 8am. The drive down to Nevada City was perfect-no cars except me heading in that direction at 6:15am! I love selling at shows! I love the setting up, arranging my stuff on an 8’ table so everything is decorated and fits just so, and then when the show opens, greeting old friends and talking to new friends who all share a passion for the same things I do. It just beats the sterile feel of selling on Ebay. I like buying on Ebay, but selling is so impersonal. I need that contact and conversation. I learn so many interesting things about what other people collect. Collecting is contagious! Some folks are obsessed, some buy only for their décor, others just buy what they like and new collectors are trying to add to their beginning collections. I have a dealer friend who is 89 years old and still loves the thrill of selling and buying! 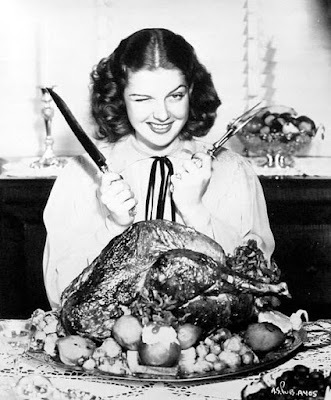 She is amazing, and I hope I’ll have the energy she does when I turn 89! At today’s show, I met Karlee, who reads my website! It’s so exciting to know that people actually read what I’ve posted! Knowing that I’ve reached even one person makes it so much fun for me and I appreciate all the kind words that I’ve received. Karlee likes old quirky advertising and she bought several things from me. Thank you Karlee, so nice to meet you! I hope you enjoy decorating with the Flapper Curling Iron and the quack medicine. They will be conversation pieces, for sure! couldn’t pass up. I collect advertising match holders. They are hard to find at shows and rarely seen at shops, and are usually beyond my comfort zone for price. But, Cecil Sanders had 2 of them and he knows I collect them. Cecil is the chairman of this show and at one time, was featured on American Pickers. He has an amazing personal collection, but that's a whole other story! He sold both of the match holders to me for a fabulous price and they’ll go on my kitchen wall with the rest of my collection. Love them! New York during the late 19th century who was most known for its intricate and elaborate color lithography. Ginna started production in 1874 and was later acquired by the American Can Company in 1901. 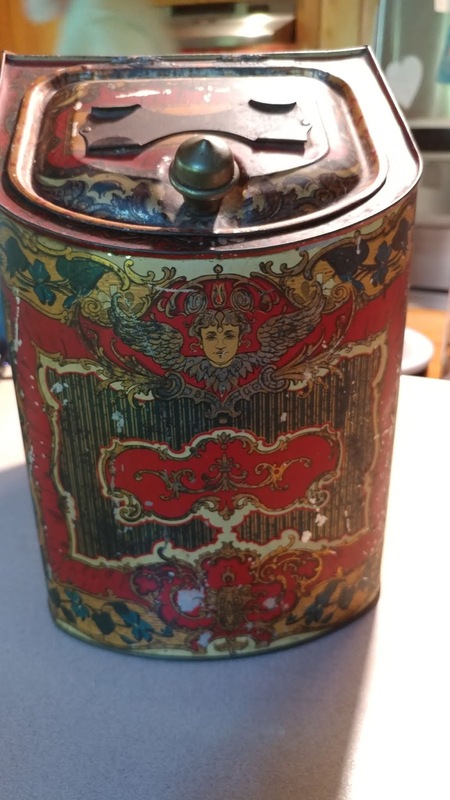 Very few tins are actually marked by the company and I am thrilled to now own one of the earlier examples. So, it was a successful show and a really fun day in Nevada City! Already planning for my next show! Home now and enjoying a nice glass of wine. Cheers! Liars, Tall Tales and Boasts, Oh My! 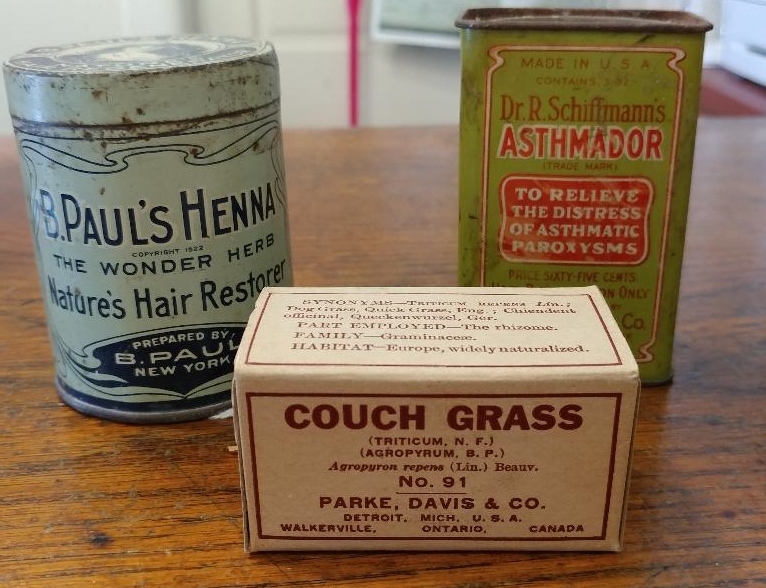 Quack medicine, questionable food claims and beauty supplement benefits! 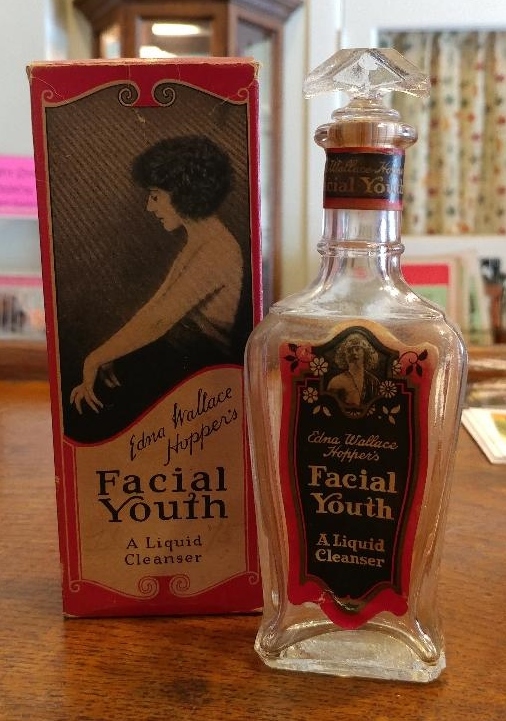 The American term for quack medicine was “snake oil”, a reference to sales pitches in which the sometimes outrageous claims of medicinal successes were attributed to the exotic ingredients of their product. 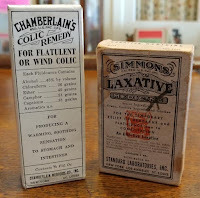 Those who sold them were called “snake oil peddlers” or “snake oil salesmen”. These opportunists often used enthusiastic and deceptive sales techniques, including “fire and brimstone” sermons, theatrical productions, and confidence tricks. Full of alcohol, opium, cocaine and other unregulated substances, it's not surprising that their users felt like the pills and tonics were doing something, even if they became addictive. 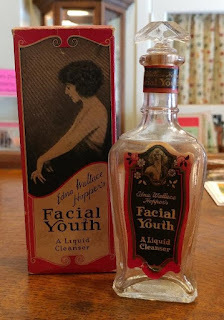 Benefits of certain foods and beauty enhancements were boldly erroneous, as well. It was a time of sensational advertising and claims that were unproven, but enticed the consumer into believing. 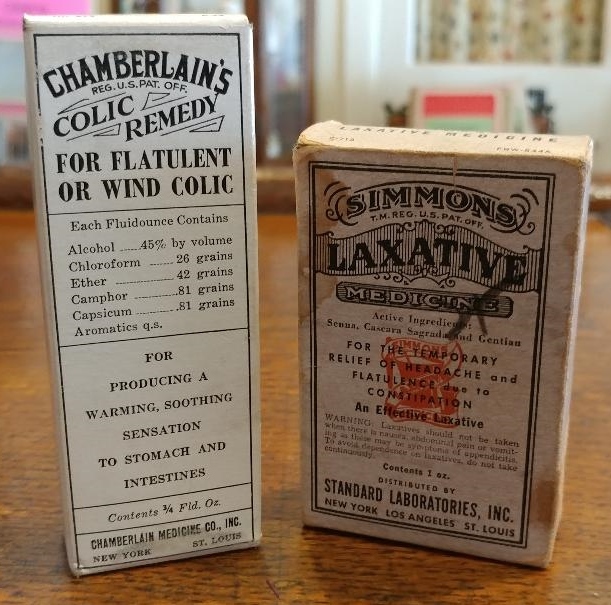 Vintage Gal Antiques has a great collection of "quack medicines" dating mostly from the 1910- 1930 era. 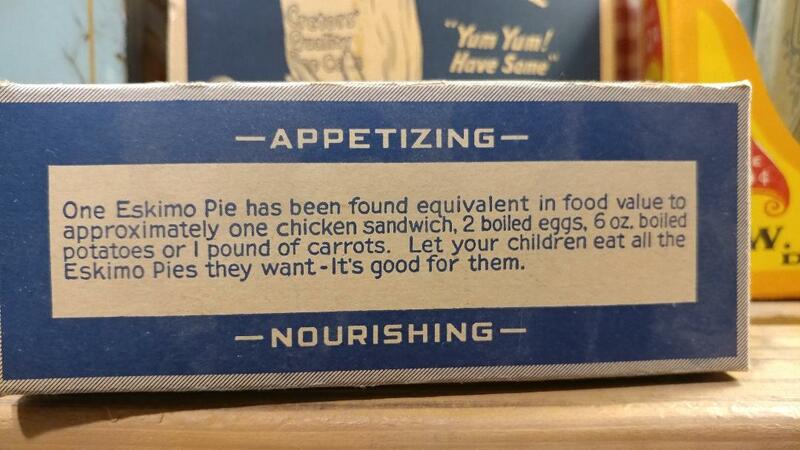 So fun to read the labels! Check it out! Is Couch Grass what grows when you sit around too much? Really? 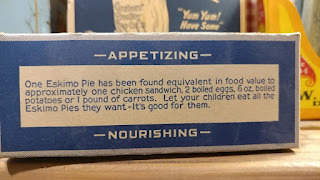 Compared to a chicken sandwich, eggs and veggies? 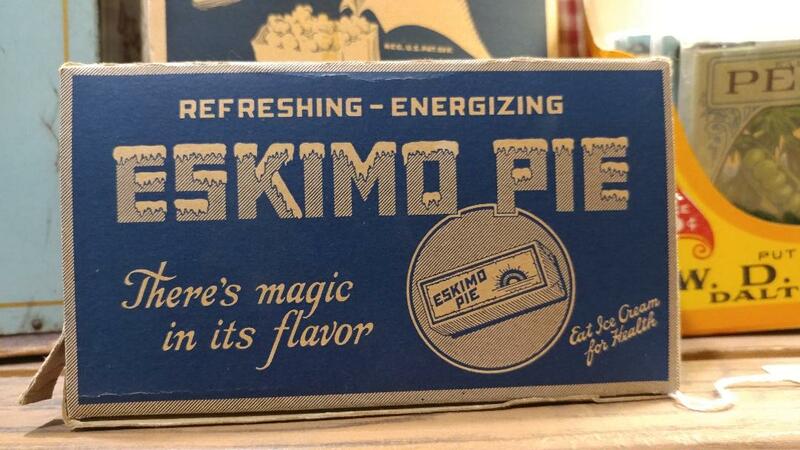 And some interesting claims about the healthy and nourishing benefits of Eskimo Pies! 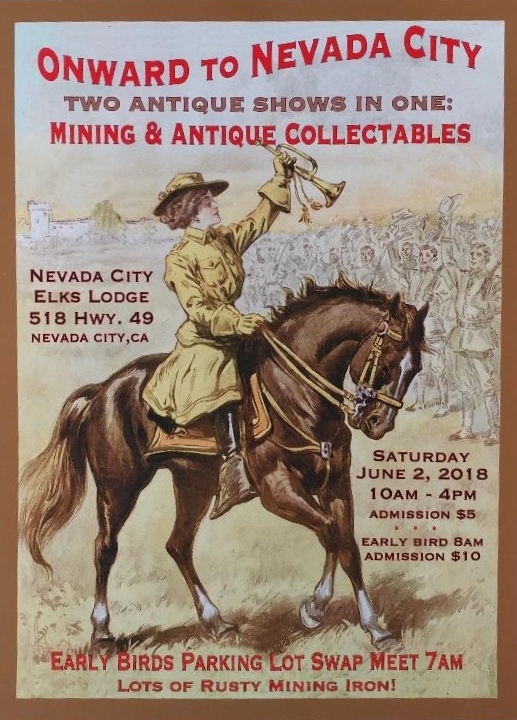 I'll be bringing some great old Nevada County prints to the Nevada City Mining & Antique Collectables Show on June 2. In my earlier post is all the information about the show that will be held on June 2 at the Nevada City Elks Club. What a grand old house it was! I also have several Sierra County framed prints available. One is the B.T. Eggleston residence in Downieville on Commercial Street, now known as the Parsonage House. Stop by Vintage Gal Antiques if you're shopping for items of local history! 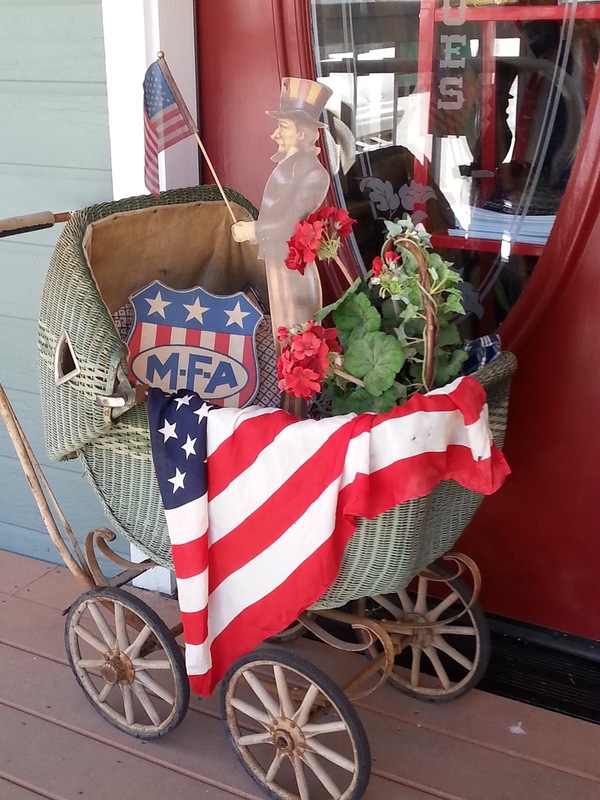 Rust and Relics ~ Onward to Nevada City ~ A New Show Coming to Nevada City! A favorite show-the Nevada City Elks Lodge #518 Mining Show-is now combined with an Antiques & Collectables Show and will be held June 2, 2018. Two great shows in one! Early Bird Parking Lot Swap Meet starts at 7am and will feature lots of rust and mining relics. The indoor antiques & collectables show runs 10am - 4pm for $5.00 admission. Early birds can enter the show at 8am for $10. There will be lots of good quality antiques for sale! The Nevada City Elks Lodge is located on Hwy. 49 and has lots of parking and easy in and out. 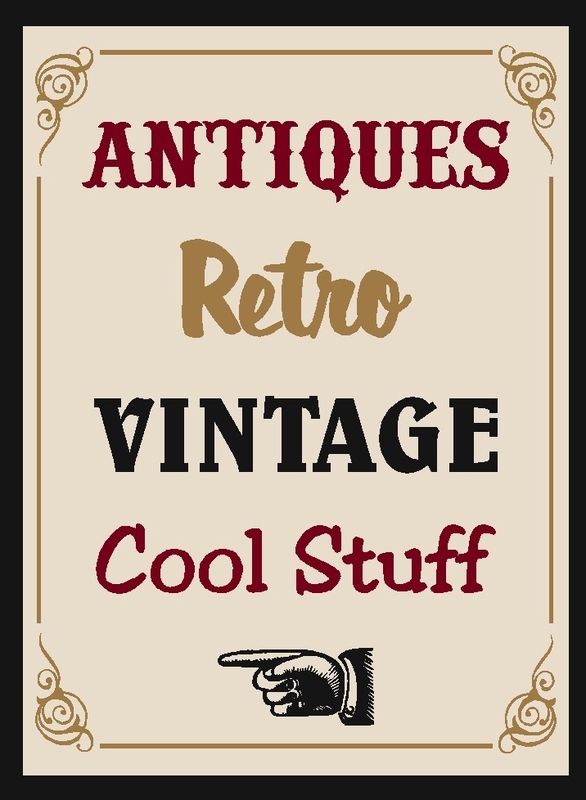 I have been told that there will be 60+ dealers and Vintage Gal Antiques will be selling there, too. Dealers interested in selling-please look for Cecil Sanders' table at the Old West Show in Grass Valley. He will have contracts and flyers available. Don't miss this one stop to shop show! 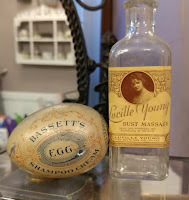 An eclectic blend of interesting finds. A table top lightening rod, rather uncommon in the western states. Some colorful advertising die cuts and vintage bingo cards. Also a stoneware crock from the 1800's era. And a Cingolani accordion from 1940-1950 that was played by my husband Rick, in the 1960's! Being Italian, it was almost required that he learn to play it, although he said he'd rather play the electric guitar! The red keys make it an unusual piece. 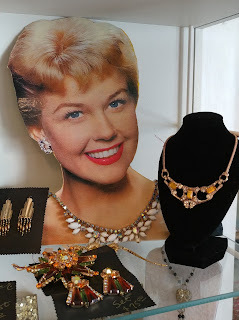 All here at Vintage Gal Antiques! Graniteware was produced throughout the Midwestern and Eastern United States from 1870 until the end of WWII. Patented in 1848 by New York inventor Charles Stumer, graniteware was also known as agateware, enameled ware and speckleware. Close cousins of graniteware are those pieces whose grays and other colors were mottled or marbled. Colors appeared to blend into each other or swirl separately to create random, eye-catching patterns. Chrysolite Swirl, a deep green and white swirled pattern and Cobalt Blue Swirl are hard-to-find examples of mottled enamelware. Vintage Gal Antiques has a nice selection of kitchenware in these two unusual colors. 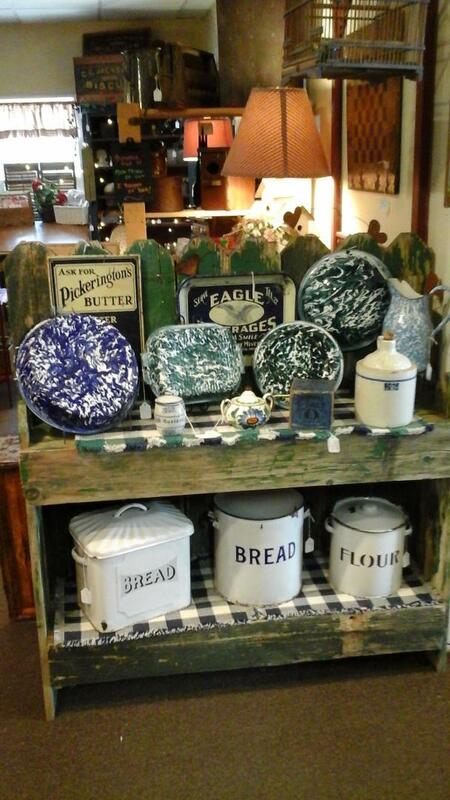 Also popular are porcelain enameled bread and flour boxes. Many reproductions are currently being produced, but the examples shown here are original pieces from the 1930's. 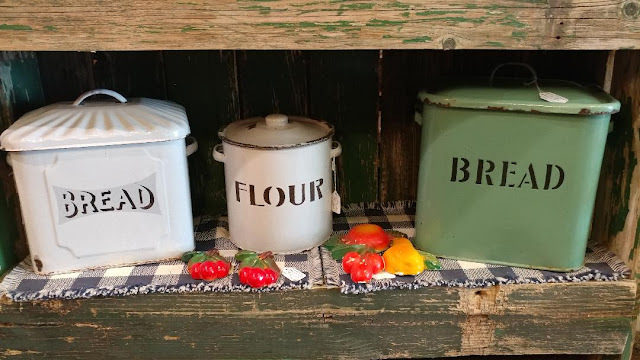 Perfect for your farmhouse style kitchen! These sweet faced advertising cows and adorable calves are tin die cut sets dating from the 1920-30s. 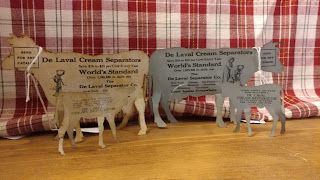 They are old and authentic advertising pieces from the De Laval Cream Separator Company. 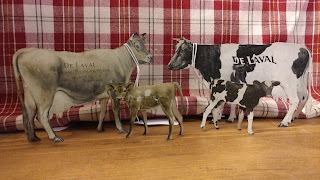 The cow sets were part of an advertising campaign that sent these little cattle to farmers' homes, encouraging them to write in for catalogs and buy De Laval products. Several breeds were used -- these are Jerseys and Holsteins. The other breeds that were available were brown/white and black cows. From the 1870's Gustaf De Laval (1845-1913) developed machines for the dairy industry, including the first centrifugal milk-cream separator and early milking machines. His first separator was patented in 1887 and the first milking machine in 1894. 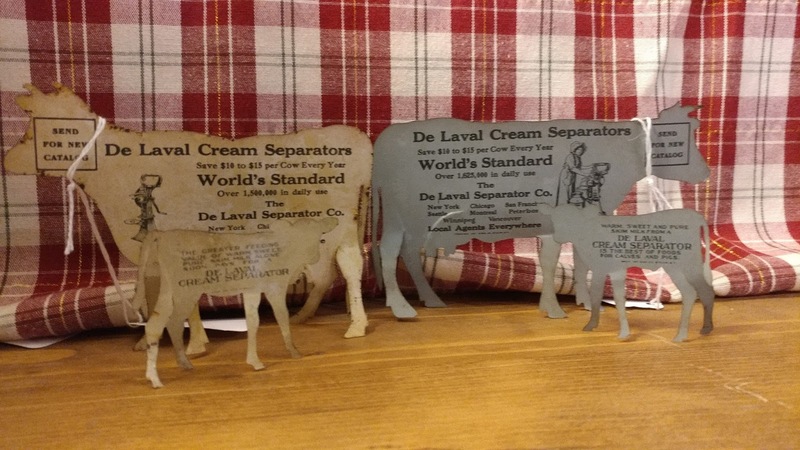 From the early 1880's, De Laval's cream separator was promoted internationally. In 1888, the company founded the De Laval Cream Separator Co. in the United States, as a subsidiary.